Already own a home in the Hawthorne Glenn subdivision? Thinking of selling? Click here and read about current search trends & our web network. Hawthorne Glenn is an upscale neighborhood in Fairhope. From the iron gate entrance of Hawthorne Glen you feel a sense of luxury living with its winding sidewalks connecting well maintained-landscaped lots, underground utilities and natural gas being available. 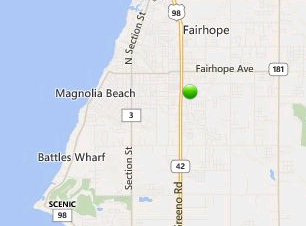 This Fairhope neighborhood is located in the heart of the city. From I-10 head south on Hwy 98 (Greeno Road), turn left at Nichols and Hawthorne Glen will be on the left. Enjoy the close knit feel of Fairhope while in walking distance to restaurants, the hospital, pharmacies and shopping areas. Home styles in Hawthorne Glen are mainly craftsman and traditional. These D.R. Horton homes are 3-4 bedrooms, 2-3.5 baths ranging from 2150-3000 square feet. This luxury Fairhope neighborhood has homes that are moderately priced from $210,000-$338,000. Many vacant lots still available so pick your lot and watch as your dream home comes alive.